The style and nature of business parks depends very much on the nature of the businesses and the budgets available. The general philosophy we project is one of sales combined with employee welfare. This generally means providing a good first impression to visiting clients, whilst providing staff with areas in which they may relax during their breaks. The individual emphasis is dependent on the nature of the client, and their wishes will always be taken into consideration in providing a comprehensive design solution. 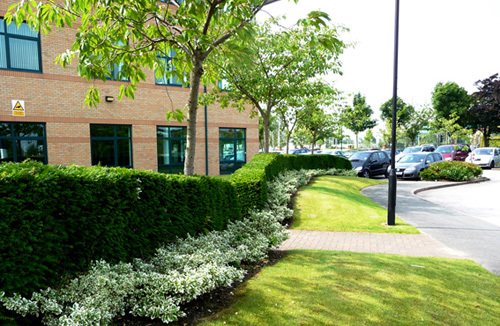 We can provide an overall design for the business park, taking into account the infrastructure, entrance, individual units and any related buffer landscaping, or design individual areas as necessary. Our services range from an initial landscape survey and site planning, through to detailed design, including seating areas and courtyards. We will provide fully quantified and scheduled schemes for discharging planning conditions and for tendering purposes and can provide a supervisory role to maintain that the works are carried out to the highest standards. The enhancement of the external areas to commercial properties such as Public Houses, Hotels and residential homes can have a dramatic effect on both the usage of these spaces and the overall impression of the buildings concerned. By the clever design of the open spaces around these building additional revenue can be gained by external dinning/drinking and the creation of attractive gardens for the benefit of residents, which could also be used for functions such as wedding photography. The enhancement of these areas can also improve parking facilities in some cases allowing for possible overspill parking for larger events.